Would you help me with a self publishing test? Since “How do I earn in Ecuador” is the most asked question we receive, we are continually testing new ideas to help our readers learn how to earn though self publishing in Ecuador or wherever they are. We are doing a new test now and hope you’ll help out. Our good friend, Bob Gandt, recently sent this note. 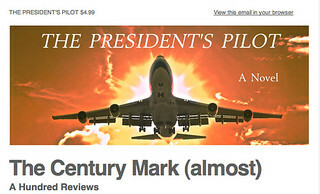 THE PRESIDENT’S PILOT just passed 90+ Amazon reviews… nearing the magic Century level which lifts a new book into rarified air. In case you wondered, yes, reader reviews have a huge effect on the Amazon ranking list. So you’ve read the novel… and haven’t yet posted a review? Please don’t be shy. You haven’t yet read THE PRESIDENT’S PILOT? Then waste not a minute more while the Kindle version is at the special price of $4.99. You won’t put it down, I promise. I agree if you read Bob’s book you will have a hard time stopping and I proposed to Bob that we try a test to see if passing that 100 review mark really made a difference. I’ll be adding a lesson based upon the results in our Self Publishing 303 course. If not, please buy the book. Then please review it and please let me know. I’ll send you the self publishing lesson about the result free. Bob’s writing niche is flying. He published his first story at age sixteen – the same year he first soloed an airplane. Since then he has logged something over 25,000 hours, written fourteen books and published countless articles. Bob has written and published through the traditional publishing route as well as self published electronically. Hearing the stories of others like Bob help me (as well as you) better understand how many different ways there are to Write to Sell. At age 20 he was at the time the youngest aviator in the U.S. Navy. In 1965 he began his 26 career as a pilot for Pan American World Airways. His 1995 book, Skygods (Wm. Morrow & Co.), recounts the meteoric descent and crash of the once-great Pan Am. His 1997 book Bogeys and Bandits (Viking Penguin) told of a training squadron at the same base where he had trained years before. This book led to a CBS series Pensacola: Wings Of Gold. Bob worked as writer and technical consultant for this twenty-two-episode series which starred James Brolin as the commander of a Marine F/A-18 training squadron. Now Bob’s focus is on self publishing. As an author whose numerous books have been published for and sold through book stores… he now sees the bookstore path filled with dinosaurs. Bob started with print but took a special step that every writer should know. This step has helped him add Ebooks to his stable of income producing systems. Print and Ebooks are all part of the publishing process… but Ebook makes self publishing easier than ever before. Bob’s passion is flying and the military. His books reflect this. Learning and sharing your passion with like minded souls is just fun. There is no other way to say it. This is how life should be lived and self publishing lets you live it this way. Here is a short video with Bob about how to write. Your help in conducting this test is greatly appreciated. I know you’ll love reading the book. I hope you’ll enjoy sharing the information we learn from this research as well.